Buy DOW Styrofoam Scoreboard in Rochester NY, Ithaca NY and Buffalo NY from the Duke Company – a leading building materials and equipment rental company in Western NY. One stop shop for outstanding service, prompt delivery and competitive prices. for professional contractors. 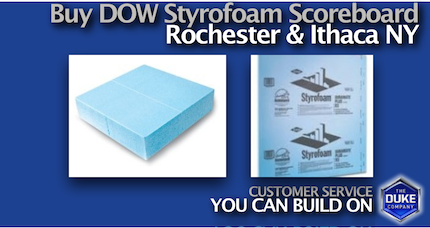 DOW STYROFOAM insulation products are renown for improving energy efficiency, weatherizing & controlling moisture for a range of building applications including roofing, exterior wall applications, geotechnical applications, interior wall applications, and cavity wall applications. DOW STYROFOAM Scoreboard is renown for exceptional quality, and is precut for contractor efficiency into 16 inch and 24 inch panels, that can be scored, to easily break- them apart. DOW SCOREBOARD complies with a range of building codes including ASTM C578, type 4; California Standard Regulation #CA To64, and Florida Building Code FL 3825. To Speak to the Duke Company’s building supply and Tool Rental experts, call 585-292-9870 (Rochester NY) and 607-347-4455 (Ithaca NY).